AMV* is a proprietary video file format, produced for MP4 players, as well as S1 MP3 players with video playback. AMV is not a native HTML5 video**, thus your AMV videos are not playable on HTML5 browsers. If want to play .AMV files on a HTML5 website or browser, you need to convert AMV to html5 formats first, then embed them into your webpage with an AMV HTML5 player. How to Convert AMV to HTML5 Video? Step 1. Download AMV to HTML5 Converter. Simply click Add Videos button to import AMV video files from your computer hard disc to the application. This HTML5 converter supports batch video conversion, you can add multiple AMV videos to the converter and convert them into HTML5 videos in a batch. Click Theme tab, you will be able to choose a video player from many of the ready-made HTML5 video themes and templates. Optionally you can also set your video size, player size, and player skin here. 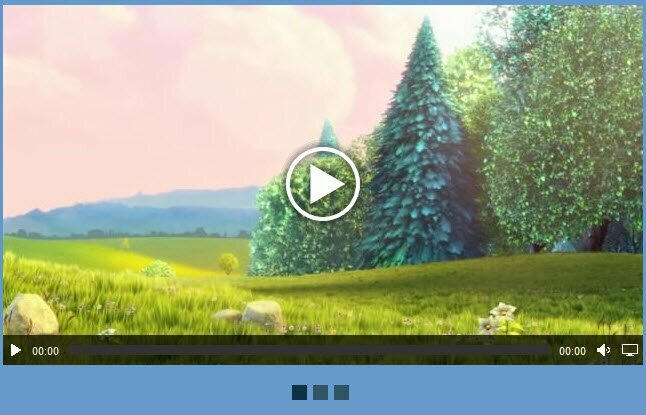 Click the Preview button to view your AMV videos in HTML5 player, click the Publish button to convert the source AMV files to HTML 5 videos with the nice looking web video player. Now you have converted AMV to HTML5 video, additionally you get the professional HTML5 player as well. They can be found from the output folder of this AMV to HTML5 converter software. It is time for us to publish the HTML5 video online now. How to Add AMV to HTML5 website? In the first half of this AMV to HTML 5 tutorial, we showed you the steps to convert AMV to HTML 5, now please follow bellow steps to embed the HTML 5 videos into your website. The HTML 5 videos and player will be published to your local hard disc first. Run the AMV to HTML5 converter, go to HTML5 menu >> Open Output Folder, find the HTML 5 video project we have just created and upload them to your website directory through FTP client. 2.Copy HTML5 video embed code snippets and Paste to your Web page. From the output folder, there will be a html5video.html created with each html 5 video project published. Use a text/page editor to open the generated ‘html5video.html’ file and switch to code view. You can get the embed code for your HTML5 player there. See details here: HTML5 Video Player Support – To embed HTML5 video to your webpage. Now you know how to easily convert AMV videos to HTML5 and publish them to your website with HTML5 video player(s). Have Fun! *AMV: a proprietary for audio and video with file extension .amv and .mtv. AMV videos are typically saved in low resolutions (from 94×64 to 160×120) to fit the screens of the media players; can usually be played on a PC using the software included with the portable media player. **HTML5 video: Refers to native HTML5 video/codec: MP4 (MPEG 4 files with H264 video codec and AAC audio codec); WebM files with VP8 video codec and Vorbis audio codec; Ogg files with Theora video codec and Vorbis audio codec.